Team Midnight Creators are in! GL HF! Anyone want to team up? Most of the programming work is done and the assets are stuck somewhere in the Pipeline. For now: It looks good for team Gamescalation. We hope everyone has a good time by now. Out of the mystical land of Schnitzel Germany a group of undaunted adventurers try to take part in this glorious competition. The contestants are well studied folks from all over the kingdom. We are in, team darkfroggames joining the jam!! I am looking to form or join a team with other people around the world. I am a programmer and work with Unity and C#. Searching for a final jam team member. Hello, We are looking for a final member to complete our jam team for Ludum Dare 33. We currently consists of an music artist and a programmer, so we need a graphics artist. Our programmer has 3 years of experience in game development, and successfully finished 3 Ludum Dares, he programs in C# and will use unity for the jam. Our music artist has 2 years of experience, and has made some awesome songs! He also made music for some games. Can you make good game art in 2D or 3D? Do you dare to take your skills to the ultimate test, of making a game in 72 hours? If your answer is yes, than we want you in our team! Send us an email to ** ! Our game, Ultra Hat Dimension, is a puzzle game in which you are a hat designer. You won a prestigious hat design contest on another world, but at the ball in your honor everyone suddenly went crazy, aligned themselves into factions based on which of your hats they’re wearing, and started attacking each other and you. So your goal is to get out of the palace. To do so, you have to get past the crazed guests, using hats to avoid getting punched backwards and to move people so they’ll get out of your way and/or attack each other. This was my first team effort, done with Woof (@woofycakes), Yuzuki (@yuzukimasu), and Eniko (@enichan). Woof was on art, Yuzuki on music, Eniko on programming, and I did the writing, level designs, and mouth sounds. As someone who always found group work incredibly frustrating in school, I was pleasantly surprised by how awesome it was to focus on one area and let the others take care of their areas so we could end up with a game which has been very well received. This is a long postmortem, so read on after the break to learn more about how we made it! The player controls a company in its road to become a big corporate. To make this happen you have to buy your competitors to destroy their company after and gain more market share. This is an actual behavior of many corporates and it is represented in the game with cash-bullets you throw to your competitors: you will both damage their budget (energy) and their growth. A negative growth means they will “bleed” their budget with time. Also competitors will fire at you with their coins to damage your growth factor, but you can click on the coins and collect them adquiring more power. We will not have XP or stuff like that, simply you will level up each X competitors you destroy. We will probably have 5 levels for you ready at the end of the ludum, on the last one you will get a really famous company, try to unlock it (without looking at art assets, cheater! :P). The player controls a Company which can use its money to destroy their Competitors. The unconventional weapon is the cash you throw (maybe not that unconventional, according to the book :P). this is Sentendo team from Barcelona, Spain. The player controls a Company which can use its money to hit Competitors. The unconventional weapon is the cash you throw (maybe not that unconventional, according to the book :P). Destroy your competitors buying their companies (attacking them with cash bullets) to get more economic power for your company. The money will grow automatically with time if you have a good growth, otherwise you will start to lose it. Since Growth factor is a percentage, the more money you have the more you will earn with time. 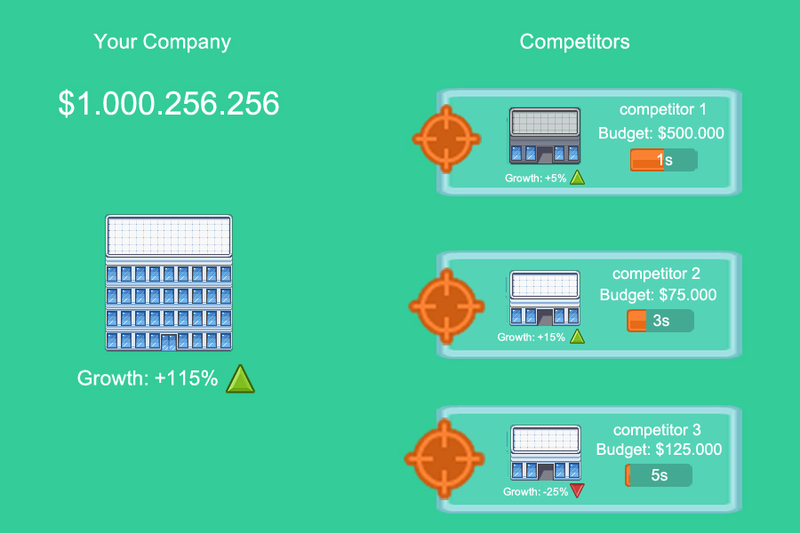 You can attack the competitors clicking on them and fire them with cash bullets (not in the image) to damage their Growth factor. This will be your “unconventional weapon”, and it uses your Budget pool as ammunition. The more attacks the more damages you make to the competitor’s Growth factor, up to its destruction (their Budget reaches zero). Also competitors attack you influencing your growth factor each X seconds. lose condition: your budget reaches zero. win condition: no one, there is no any Nirvana in the cruel capitalist world, so the game is potentially infinite. That evening I was watching Game Awards 2014 and waiting for LudumDare jam theme announcement. I was puzzled when I saw that “game on one screen”, it seemed too vague and uncertain. I began thinking, researching and surfing references for inspiration. Meanwhile, I was listening to the music that was written for LD # 31. Accidentally I discovered a screenshot of a game where the view and perspective have suggested the idea of a game we could do. The wounded knight would be the backbone of our game, and the sword would speak with the knight and the player. The remaining features of the gameplay were drawned upon me in the morning when I was half asleep on my way to the office. Right after I heard the idea of the game, I imagined clearly the whole picture of dungeon, the wounded knight in the center and crowds of monsters. I started estimating the time for drawing all the elements and thinking about the animation. We were lucky that we had another artist, she helped us so much. It would be extremely unpleasant to realize that we do not have time to cover the entire scope of work (without her). The best feature of the game is that it lasts no more than 4 minutes. This greatly simplifies the task. With this in mind the game needed only one location, a couple of mobs, a knight and a sword. I was also on to preparing some special effects. Luckily I was acquainted with Unity long before Ludum Dare, so the effects were made in no time. While I was preparing background , special effects, and the main characters, other artist was preparing monsters and their animation. In between painting, I overlooked the line-up of game elements and coordinated the common style in artwork. Working with the team was very interesting. Due to involvement into another project, I had to work at an accelerated pace. I have to admit , I was not satisfied with the results in artwork. But, all in all we did it well! And the game came out even better than we expected in the beginning. For me the project is decent for a two-day work. Not perfect, but worth being proud of. It’s a finished game, and it’s fun to play. Most of the classic games actually do not contradict concept of “game-on-one-screen”. So the jam theme directly hinted: make an Arkanoid, Tetris, or text adventure. But we thought that there would be plenty of games in these genres. Eventually we settled on an idea of slasher in which the hero was limited to one screen, because he was not involved in gameplay And the effect of crowding and lack of a screen is achieved by narrowing the circle of enemies. The most difficult part of the game was to make the movement of a sword. Not that Unity physics is hard, but to do an accurate and comfortable sword swinging wasn’t as easy as it seemed. The sword was either too slow and boring or too easy to swing. But as soon as we found a middle ground it became clear – it would turn out cool. It took time to make a narrowing darkness around the hero and it seemed rather difficult to make the intro with two light spots. The final decision turned out not very flexible, but it worked almost immediately and looked great! It is impossible not to appreciate the opportunity of participating in jams like Ludum Dare! It’s a miracle that we can get together with friends over the weekend and create a game that will please and inspire many people. Working as a team with your friends means to be confident that the process will bring a lot of fun, and the result will be as good as possible. I found out about this jam just hours before it started. I am very glad that nevertheless I attended and received an unforgettable experience. This’ll be my one year Ludum Dare anniversary. LD28 and LD29 were a lot of fun. LD30 was quite a failure, but a learning experience regardless. May I be blessed by the snowman for LD31! I’m assisted this time by Jeremy Breau of Antithesis Design. The media assets he’ll be creating will no doubt be far better than any weak vector art I would throw together, and having a partner with whom to share the design efforts is always rad. 21 queries executed in 0.119 seconds.